Thanks - I'll delete and re-install.. Does the custom 3dl shader apply automatically? I look forward to when I know what I'm doing, but I'm getting decent results from my experiments. Works in 3DL immediately when you load it - but if you don't usually work with GC On 2.2, you'll need to adjust that in render settings. Excellent. If that's a 3delight render, I bet you have Gamma Correction on and set to 2.2. Good for you! Is there a readme or similar anywhere? I can't find it in installed files. Folks often have trouble finding the ReadMe. That is why I've put the instructions on 3 plane props that you can load into the viewport to read. You can find them in the same place that you load IBL Master from ( in My Library > Props > Parris > IBL Master). Yes to both - and this light much better than UE2. It doesn't look like the converted hdr->tif files that many UE lights use work though if anyone was wondering (I didn't expect they would...). ...maybe I should rephrase my question. For 3DL, does IBL Master create it's own indirect and bounce lighting that can be used with the Advanced Distant and Spot Light, or do I need to use an HDR environment, which is usually are UE based, for it to work? I rarely use UE because of the extremely long render times (similar to Iray in CPU mode). I also tend to build my scenes with geometry and skydomes or photo backdrops rather than use pure HDR environments (in either 3DL or Iray) as I couldn't see how the sphere was oriented and had to waste time performing numerous test renders to get it positioned where I wanted it. Product is in the cart but haven't clicked "Checkout" yet. Besides being a directional controller, this is an IBL light. So it replaces UE. Use of the HDRI as a background is optional. This is new technology, so it is way faster than UE, as well as doing specular, other features that UE can't, etc. Maybe this image will help? ..thank you. Heading back to the cart to click Checkout. As I also use Iray (and recently purchased the entire IBL Skies Bundle) this will also be a big help as Iray View mode is not only painfully slow to refresh on my older system but eventually crashes Daz since I don't have a beefy GPU card It will also longer mean I have to do o multiple render tests for positioning. When I render in 3Dlight, I can see the HDRI as the backdrop in the image I render but there is no light. Everything in the scene is black except for the ground plane. Also, the ground plane shows in the scene with no shadows on it. I used DAZ Connect to install the files. I'm loading in the IBLM and it starts with the default IRay HDRI on it. If I render in IRay, I get light. When I switch to 3Delight, I get the results mentioned above. Then I tried an IRay IBL preset that is much higher quality (Out Of This World from the DAZ store). It still works fine in IRay but the same problem persists in 3Delight. Am I doing something wrong? When I render in 3Dlight, I can see the HDRI as the backdrop in the image I render but there is no light. Everything in the sceen is black except for the ground plane. Also, the ground plane shows in the scene with no shadows on it. I used DAZ Connect to install the files. I'm loading in the IBLM and it starts with the default IRay HDRI on it. If I render in IRay, I get light. When I swich to 3Delight, I get the results mentioned above. Then I tried an IRay IBL preset that is much higher quality (Out Of This World from the DAZ store). It still works fine in IRay but the same problem persists in 3Delight. Am I doing something wrong? 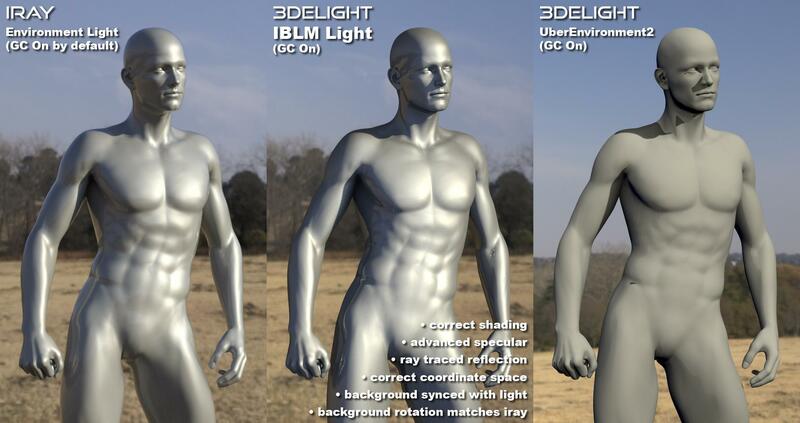 Sounds like Daz Studio is not finding the 3DL IBL Shader files (so no light in 3DL). If you click the arrow to the left of IBL Master Control in the Scene tab so that it is expanded, you should see IBLMLight underneath. Please select that, then on the Parameters or Lights tab click on Light. You should see a whole lot of parameters starting with Intensity. If you see only a couple, then the light shader files are not installed right. Manually on a PC, if you are using Daz Studio 4.10, there are four files that go in Program Files > DAZ 3D > scripts > support > ShaderBuilder > Light, and one that goes in Program Files > DAZ 3D > DazStudio4 > shaders > ShaderBuilder > Light. Sorry for the hastle. Please let me know if that helps. Thanks. You were right. There were only a couple of entries in the list, Color and Intensity. I uninstalled it from Connect and then used DIM to install it. It is working as expected now. Thank you! You can always load a JPEG if you want to. But I don't think there is a good way to modify one to get high dynamic range out of it. While I've got you here, one thing that has always bugged me about HDRI in Iray is the amount of light they throw on objects in the scene compared to how bright the BG is rendered. When using your product with 3DL, can these 2 things be controlled independently? I don't want to derail things, but OMG that would be amazing. Speaking of game shots, have you tried a game that has Ansel? Ansel can create native raw 360 HDR up to 8K in EXR from right inside your game (maybe higher, my GPU might limit the size.) I made a couple HDRs with Hellblade. I hid my character behind a tree and positioned the Ansel camera in a different spot. The resulting HDR light works, but sadly is still flat. I'd love to be able to make this HDR more dynamic. But all I have is GIMP and it is not HDR friendly. I'd love to be able to take the HDRI from that game and use it in Daz with this IBL Master. Perhaps I still can using the ghost light boosters from this product. Just being able to see the HDR image in Daz would help a lot, even for fake HDRIs. Hmm. I am pretty excited to try this product. Maybe I'm missing something, but I can't seem to get the sun to change directions? I thought the whole point of the little ball helper thing was so you could move it around and position the sun? Even when I move it and the sun is reflecting in it, the sun was in the same spot on the render. I had two installers when I bought it earlier, do I need to uninstall it and reinstall it? I've attached a few of my pictures. I tried changing the way the lights hit the character, but I must be missing something. The two orange ones are with what I thought was the light rotated different directions. The second one with a more upward angle, the sun was on the ball and I assumed it would mean it would hit her face more. I have no live preview of anything in studio when I'm doing this. 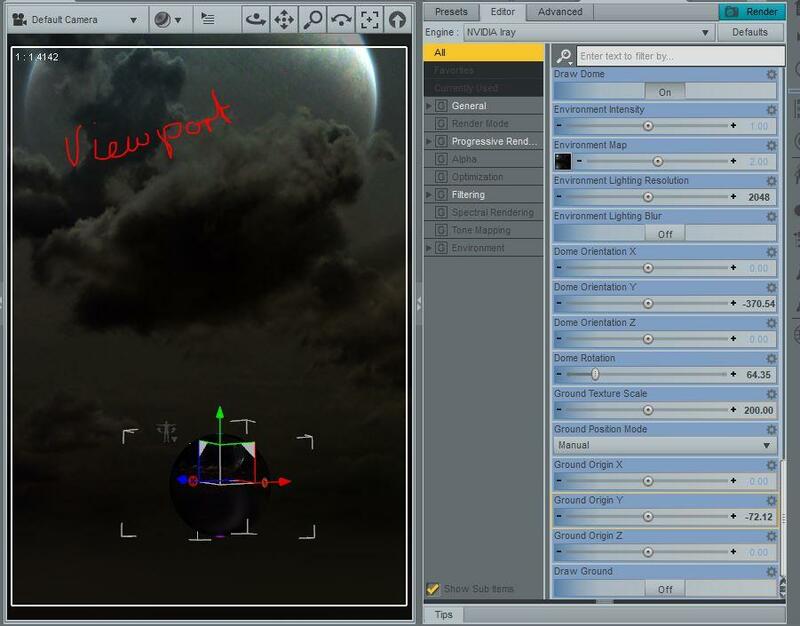 The light blue sky is just me slapping the iRadiance sky on the ball and rendering with the iRay render engine. These took like 5 minutes max time. But all I have is GIMP and it is not HDR friendly. So will this take 3DL iBLs and make them just work in Iray? Will it let me (easily) use, say, Lantios GIS lights/skydome textures in Iray or am I barking up the wrong tree entirely? I tried a recent build and still had trouble loading some of my HDR files, let alone doing any editing to them. Plus the new builds are IMO sinfully ugly and manage to make GIMP's GUI chaotic and messy. It sets off my ADD just looking at it and the icons are hard to see. It actually gave me a headache after trying to look at it for a few minutes, I have never had that kind of reaction to a piece of software before, not even Blender. Blender makes me feel stupid and depressed (because I just can't get it,) but it didn't give me a headache. At any rate, have the installers been fixed for IBL? Should I install manually or DIM? I generally prefer manual, but I'll do whichever if it works. My DS library is split around. You can edit HDRs in Natron. Sorry for the dumb question, but are the HDRI just backgrounds image? I also tried to add both the sale beach ones to cart, but it isn't giving discount and free item anymore. So is this suppose to work in Iray or not - I can get correct results in 3dl but not Iray? Absolutely it works in Iray. I don't have enough information from what you are telling me to know what is wrong, though. Can you show me Iray Render Settings > Environment? Can you show me a render? If you rotate the IBL Master Control prop on the Y, does the value change for Ground Origin Y? This should be easy to use but it is still a complex bit of machinery. So figuring out what is wrong for you may not be so easy. I'm willing to help though if you can be patient with me. Thanks. Deleted most of the post as superceded by events. Will do some more experimenting. Seasonal good wishes to all. 4.9.4.122 seems to work ok, with the basics at least from what I've tested. I was never any good with 3Delight so haven't been back since IRAY appeared. But early results are impressive (by what I achieved previously). I dunno if it's been mentioned yet, but for those who say that the IBL Master is not working for them, make sure that your IBL Master is selected and that CMS is working (hamburger menu_Start CMS). It didn't work for me either before I did that :). Now it does. If it has been mentioned, then ignore me like usual.....lol. One more thing I've noticed: if the number in the dome rotation in the render settings tab and the y rot on the IBL Master are not in sync, then it can effect what gets rendered. Reset both and start over using just the IBL master and you'll start getting renders of what you see in the viewport and the number on the y rot on the IBL master and the dome rotation will start to match. In case it has not been mentioned, HDRI Haven is a great resource for free HDRI. I chose to support him via Patreon, when he decided to go free. If you like it, I would encourage the same! At the least, for $1/mo ($12/year), you can support the creation and release of more HDRI. LOL the image I posted above is his Autumn Hockey HDRI ;) I did mentioned HDRI Haven in another thread in the commons that now seems to be gone. Edit: Oops, not gone...just fell off the front page temporarily hehe. well.. I still need to do more work learning this... but here's the first 3dl render with it.. I was a little hesitant to get this, but finally bit the bullet (aided by the loyalty bonus!). So far I have mainly used it for 3Delight renders and, ye gods if it only 'did that' ('that' being a real-time display of what teh HDRI 'backdrop' would look like) it'd be worth the money. Not fully explored it yet so looking forward to more joy! I would stress the potential need to enable Gamma correction at 2.2 as the 1st 3Delight attempt I had was almost a complete whiteout, then I rememeber Parris, I think, mentioning stting GC to 2.2, so did that and .. wow! Thank you for sharing and Allenart also on another thread. These looks great! :) I am still playing myself with this. What size do most people sugeest having for an HDRI? Thank you for the images. They make all the difference, as I am blind otherwise to what is going on for you. To be honest, I was still stumped for a while, but this morning I was able to see the problem. Dome rotation needs to be zero and should not be used. It does the same thing as Dome Orientation Y but in reverse, so that is why the rotation is not synced. At some point you or a preset from someone else must have changed that value, and that's when things got messed up. I'm sorry for the hassle. But I hope you can understand that there is no way for me to fully anticipate what others will do. This is new science, so I'm still learning. There is no logical way I know of for me to hook remote control up to both parameters since they are working against each other, but I will see to it that warnings are put out in appropriate places. I hope it is of some consolation that by sharing information with me in this forum, you are helping to make things better for others. Thank you, and please let me know if your problem is solved! The one thing I found out from HDRI Haven is that the HDRI's they have only seem to work with Iray and not with 3DL, since when used with 3DL it pops up an error and pretty much oversaturates the scene with light.. The ones from HDRLabs do work with 3DL as they have extra files supplied such as .env files and so on..
On other things would love to see a 3DL version of Iray's Emissive Lighting for objects, wondering if now possible as since this product seems to make that option possible.. The reason for that is that you can use IES files in this product as well..
You're right. I just tried it. HDRLabs work, HDRI Haven do not....not in 3DL that is.